Innovative: Embracing Change | Willard Agri-Service of Frederick, Inc. Embracing Change. This year we held our first ever Self Applier workshop on the lower Eastern Shore in Princess Anne, MD. The event was a joint effort between Winfield and Willard. We featured a demonstration by Winfield on controlling drift and deposition followed by a presentation and discussion about using liquid fertilizers in various environments to improve uniformity and reduce trips over the field. The customers attending all gave very positive feedback. Many thanks to Joey Wolff, Eddie Johnson, Travis Stafford and Berl Jastram for help in promoting and organizing the event. 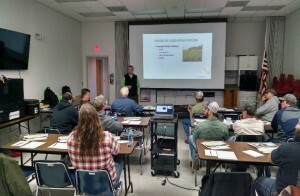 We hope to build on the lessons learned and expand this type of meeting to help our self-applier customers take advantage of the many benefits Willard has to offer them.